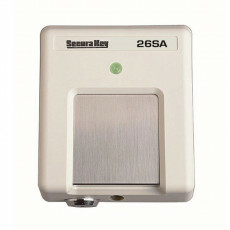 The legendary TOUCH CARD® reader is one of SecuraKey’s major contributions to Access Control. SecuraKey replaced unreliable reed switches and pickup coils with an array of self-calibrating Hall-Effect sensors, which read the polarity of magnetized locations on a BariumFerrite card. The user places the card on a non-magnetic stainless steel plate, which eliminates the requirement for a card slot, and protects the circuitry from weather and vandalism. Extremely rugged weatherproof housings with high-security locks and steel mounting plates have kept these units in service for many years. These card readers are still widely used in gate, parking, and telephone entry applications due to their reliability and simplicity. 26SA SINGLE DOOR ACCESS CONTROL The 26SA single-door card access control unit is fully programmable. Adding and deleting cards, and other programming functions are accomplished by using a special deck of programming cards, another Secura Key innovation. Nonvolatile memory retains programming after a power loss. A remote open input allows the door or gate to also be controlled from a remote switch. The reader operates on low voltage AC or DC and consumes less than 100 milliamps. 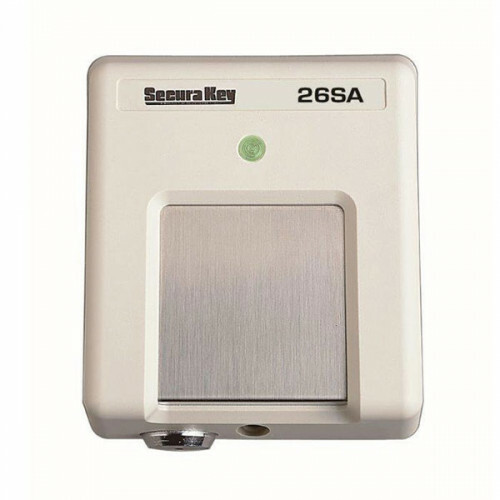 The 26SA may be used with the Secura Key SecuRelay™, which allows the lock or gate control circuit to be remotely located for added vandal-resistance. Lexan® surface mount housings are available.